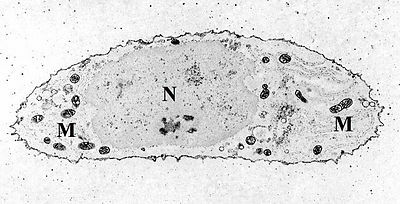 Mitochondria are commonly between 0.75 and 3 μm in diameter but vary considerably in size and structure. Unless specifically stained, they were not visible. 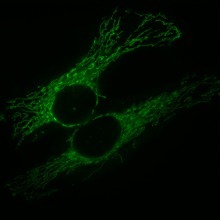 Nevertheless, the development of holotomographic microscopy has given rise to staining-free, high quality mitochondria detection and live visualization. 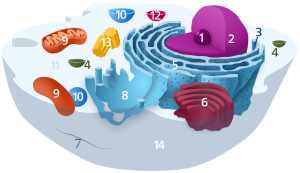 In addition to supplying cellular energy, mitochondria are involved in other tasks, such as signaling, cellular differentiation, and cell death, as well as maintaining control of the cell cycle and cell growth. 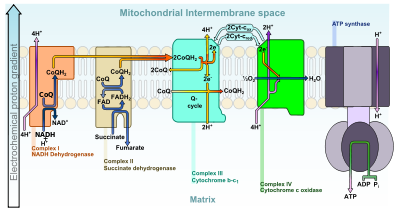 Mitochondrial biogenesis is in turn temporally coordinated with these cellular processes. 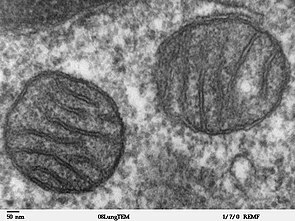 Mitochondria have been implicated in several human diseases, including mitochondrial disorders, cardiac dysfunction, heart failure and autism. The concentrations of free calcium in the cell can regulate an array of reactions and is important for signal transduction in the cell. Mitochondria can transiently store calcium, a contributing process for the cell's homeostasis of calcium. In fact, their ability to rapidly take in calcium for later release makes them very good "cytosolic buffers" for calcium. 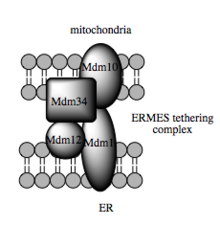 The endoplasmic reticulum (ER) is the most significant storage site of calcium, and there is a significant interplay between the mitochondrion and ER with regard to calcium. 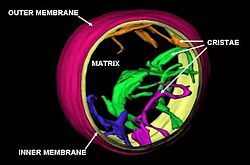 The calcium is taken up into the matrix by the mitochondrial calcium uniporter on the inner mitochondrial membrane. 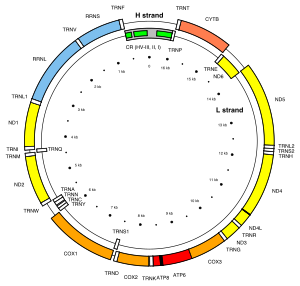 It is primarily driven by the mitochondrial membrane potential. Release of this calcium back into the cell's interior can occur via a sodium-calcium exchange protein or via "calcium-induced-calcium-release" pathways. This can initiate calcium spikes or calcium waves with large changes in the membrane potential. These can activate a series of second messenger system proteins that can coordinate processes such as neurotransmitter release in nerve cells and release of hormones in endocrine cells. ^ das Neves RP, Jones NS, Andreu L, Gupta R, Enver T, Iborra FJ (December 2010). Weissman JS, ed. "Connecting variability in global transcription rate to mitochondrial variability". PLoS Biology. 8 (12): e1000560. doi:10.1371/journal.pbio.1000560. PMC 3001896. PMID 21179497. ^ Johnston IG, Gaal B, Neves RP, Enver T, Iborra FJ, Jones NS (2012). Haugh JM, ed. "Mitochondrial variability as a source of extrinsic cellular noise". PLoS Computational Biology. 8 (3): e1002416. arXiv:1107.4499. Bibcode:2012PLSCB...8E2416J. doi:10.1371/journal.pcbi.1002416. PMC 3297557. PMID 22412363.